Photo by Brandon Macz: District 3 Seattle City Councilmember Kshama Sawant announces her re-election campaign at Saba Ethiopian Cuisine on Thursday, Jan. 24. District 3 Seattle City Councilmember Kshama Sawant said during her re-election campaign announcement that she expects big businesses and corporate interest groups to inject large sums of money into opposing her and council candidates like her this year. As with her last two runs, Sawant said, she will be fighting for the people, especially those most vulnerable. “Like always, my campaign is not for sale,” she said. The Socialist Alternative member made her re-election campaign announcement on Jan. 24 at Saba Ethiopian Cuisine, a restaurant in the Central District slated for closure amid plans to redevelop the site. Sawant is currently working with owner Workie Wubushet, who named the restaurant after her daughter, to find a new location. Sawant was first elected to the city council in 2013, and again in 2015 as the first representative of District 3, which includes Madison Park, Madison Valley, Madrona, Leschi, the Central District, Capitol Hill, Mount Baker and a portion of First Hill. She lives in Leschi with her husband, Calvin Priest, who is also a Socialist Alternative organizer. Among the accomplishments the District 3 councilmember listed during her re-election campaign announcement was championing a $15 minimum wage in Seattle and advancing legislation capping move-in fees for renters, which a King County Superior Court judge upheld last September. Sawant also has legislation written that would require landlords to pay relocation costs if tenants are priced out of their units, which she’s been talking about since 2017. While the bill is ready, she said, a movement is needed to push it through. “Gentrification is just another name for economic eviction,” Sawant said. The District 3 councilmember led the charge in the council to temporarily place the Showbox music and performance venue within the Pike Place Market Historic District, effectively stopping its demolition in order to construct a 44-story apartment tower. Property owner Roger Forbes is now suing the City of Seattle for $40 million in lost revenue from the sale of the site to the Onni Group. Sawant tells MPT it was clear before the vote that there was a strong case for including the Showbox in the historic district, including it being previously referred to as Showbox in the Market. It was called this from 1997-2014, distinguishing the venue from a second Showbox location in SODO. While the lawsuit continues, Sawant said the Seattle Department of Construction and Inspections is continuing to review the site as the council considers long-term preservation options. Sawant has been critical of fellow councilmembers for what she said is the city’s part in fueling the greed of big businesses like Amazon and corporate developers who are making Seattle unaffordable. With seven seats up in the 2019 election, Sawant said she wants to see more candidates like her running in those other districts. Sawant was one of only two councilmembers last year to oppose repealing an employee-hours (head) tax that would have charged companies claiming more than $20 million in gross receipts $250 per full-time equivalent employee; the council had unanimously approved the legislation one month prior. "Jeff Bezos is our enemy. 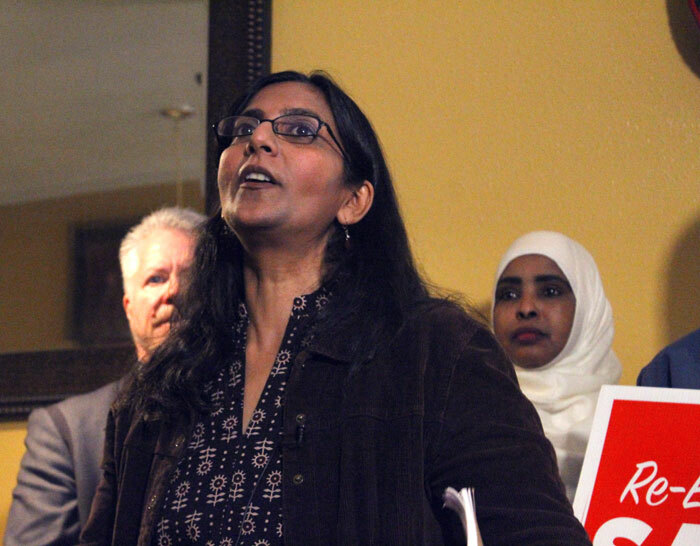 We have to fight big business,” Sawant said ahead of the repeal vote. “The question is, 'Will we have elected representatives who will fight with us or not?'" Sawant told MPT the private market has failed to resolve the affordable housing crisis facing the city, and high vacancies in downtown apartment buildings are due to not having enough people who can afford them. The only way to boost needed public housing, she said, is through a progressive tax like the head tax. An SCC Insight article from early January outlined Socialist Alternative documents that appear to indicate the group’s heavy involvement in how Sawant prioritizes the issues she addresses on the council, to which the councilmember responded with a lengthy statement on her council webpage acknowledging her commitment to democratic accountability to Socialist Alternative. Sawant said her office receives phone calls and emails every day about District 3 issues revolving around concerns with schools and parks that her staff then works with city departments to address. She pointed to her office securing funding for a health center at Nova High School and working to assist small business owners impacted by the delayed reconstruction of 23rd Avenue in the Central District; a second phase of construction is underway. While Sawant plans to fund her re-election campaign through small donations free of any corporate or special interests, she said she will not be using the city’s new Democracy Voucher program. The program is good for grassroots campaigns, she said, but hers is facing opposition backing from corporate political action committees. The councilmember said Amazon spent $350,00 to buy Mayor Jenny Durkan in 2017, referring to the online retail giant’s contribution to the Seattle Metropolitan Chamber of Commerce-sponsored Civic Alliance for a Sound Economy group. Sawant had three challengers emerge late last year: Pot entrepreneur Logan Bowers, Entrepreneurial nonprofit director Beto Yarce and Mount Baker business owner Pat Murakami. Other candidates could emerge by the June 2 filing deadline.